An honest mistake or some kind of weird rivalry bait? All’s fair in love, war, and college sports recruiting. Except, maybe, trying to recruit players who are actually already playing for another team. That’s apparently what happened recently. 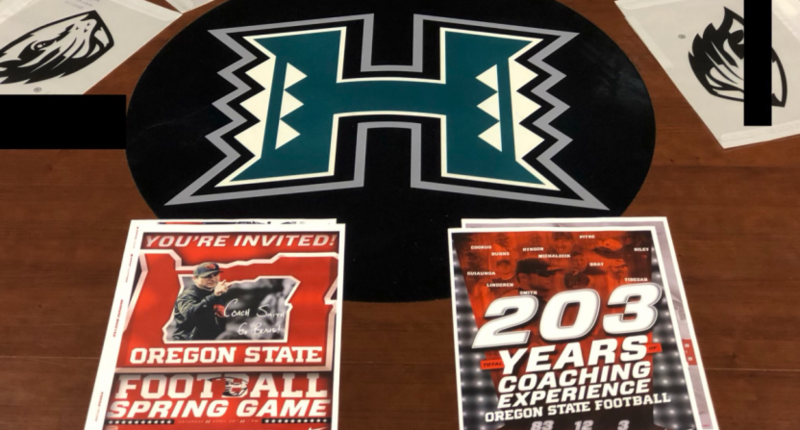 Hawaii head coach Nick Rolovich tweeted out a series of pictures on Friday morning that appear to be recruiting letters sent to student-athletes who are already enrolled and participating in the football program for the Warriors. Not only that, the recruiting pitches were addressed to Hawaii’s athletic department directly. As Rolovich points out, the letters were attempting to entice players to attend Oregon State’s spring game, which would have been a tough sell considering they were all already playing in Hawaii’s spring game the same day. You might be wondering if that’s an NCAA violation and it most certainly would be considered tampering. They’re certainly aware of the issue now because Rolovich tagged Oregon State compliance, Pac-12 compliance, the NCAA, and two media outlets in the tweet. He also tagged LaVar Ball for some strange reason and, honestly, we’d prefer that he justs ignores it and stays out of this. Did Oregon State do this on purpose or was it just one big misunderstanding and mistake? Per USA Today, they are “currently investigating the matter.” NBC Sports Northwest, which covers OSU, certainly assumes it was a mistake. Rolovich, however, wasn’t done roasting the Beavers on the topic. Because the College Football Gods are so good, Oregon State and Hawaii are locked into a home-and-home series that kicks off in 2019 at Aloha Stadium. Assuming Rolovich, who is 10-16 entering his third season at the helm, can make it to next season, that’s suddenly a pretty interesting rivalry to stay up late for.